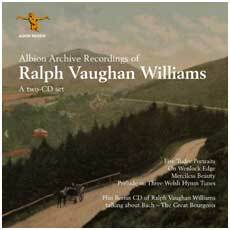 ALBION have been doing splendid work in recording rare and interesting works by Vaughan Williams. Here they turn their attention to works most of which enthusiasts will already have in their collections but in recordings they may well have previously overlooked. It should be said straightaway that anyone lacking recordings of the main works here would probably do better to investigate more modern versions, but if you already have them these would be extremely desirable supplements to those versions. None more so than the Five Tudor Portraits, a setting of verses by John Skelton (1460-1529). I must admit that previously I have found much of it, especially the first and last portraits, wearingly hearty. Having heard this version however I have revised this view. Steinberg takes a very vigorous view of the music, and this extra energy brings real life to the music. The two slower movements, and especially the longest movement – Jane Scroop’s lament for Philip Sparrow – are given real pathos without any unnecessary lingering. The three short cuts in the latter authorised by the composer are made and this helps to avoid the imbalance that can otherwise result from a movement so much longer than any of the others. Although this was a live performance, slips are few and there is a real feeling of a live occasion. Nell Rankin sings with real commitment as do the choir. The baritone, for some reason not given a biography in the booklet, is adequate if little more. The recording is also adequate although obviously much detail is lost. On Wenlock Edge is a wonderfully imaginative series of six settings of Housman’s verse. There have been many excellent recordings of it in both the original form with string quartet and piano and in an orchestral arrangement. Despite its age – no date is given but presumably it too is around fifty years old – the sound is generally tolerable. The balance tends to favour the piano but in my experience of live performances this is an inherent problem with this work, and in any event it does not prevent appreciation of a superb performance by Alexander Young. His diction is faultless and he manages to avoid sounding self-pitying or simply feeble as do some of his rivals on disc. All in all this is a performance of real character which thoroughly deserves reissue. His performance of Merciless Beauty is also very fine and better recorded. The remaining work is probably the least known. The three hymns used in thePrelude on Welsh Hymn-Tunes areEbenezer, Calfaria and Hyfrydol, all strong tunes of great character. This performance by the band that commissioned it is presumably authentic and certainly makes the most of what must be admitted to be one of the composer’s lesser but still enjoyable works. The presentation of this disc is all that could be wanted, with texts of the vocal works and extensive and interesting notes. There is also an extra disc containing a broadcast talk on the subject of Bach in which Vaughan Williams attacks those trying to perform that composer with historic instruments or a greater regard for historic performance practice than was normal in England at that time. It is usually revealing to hear one composer discussing the work of another, and this example is particularly so. All in all this is a very welcome and imaginatively chosen selection of recordings which very much deserve resurrection. As with many period recordings, there’s a hurdle to be overcome with these Fifties recordings of Vaughan Williams works – most notably, the thinness of the sound and the unusual instrumental balance that initially distracts from Alexander Young’s noble English tenor. But the performances win through: Young’s delivery of On Wenlock Edge is tremendously moving, while pianist Gordon Watson and the Sebastian String Quartet capture the nuances of tonal colour resulting from RVW’s studies under Ravel. The three Rondels of Merciless Beauty are similarly affecting, while the brass piece “Prelude on Three Welsh Hymns” is rendered in stirring manner by the Salvation Army Staff Band.